Over-spending on roads is a bad idea for any state DOT. But it’s an especially bad idea if that state needs to retain more young people who don’t want to be shackled to cars. Most college students surveyed by WISPIRG said they value having transportation options besides driving. 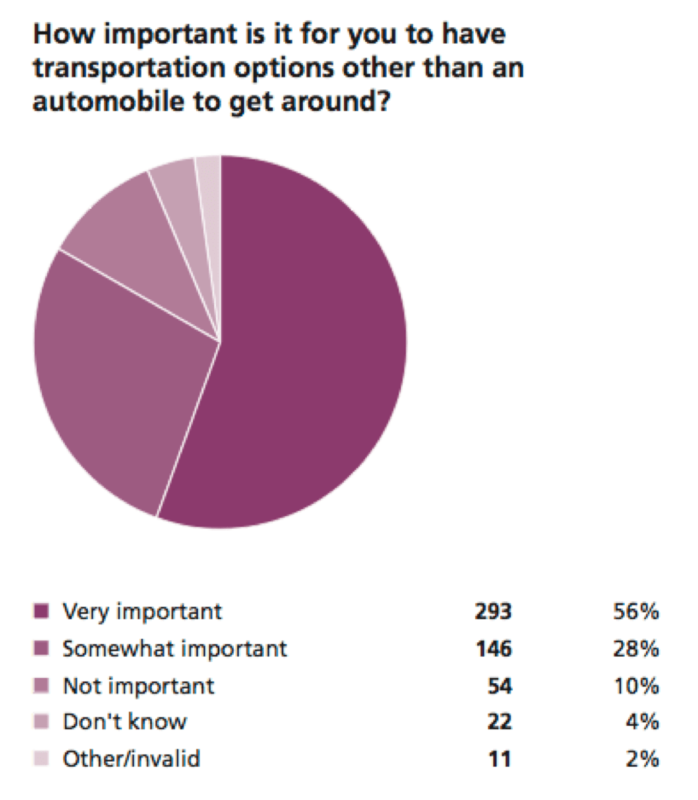 In a non-scientific survey of 530 college students in the state, conducted both online and on campuses, 47 percent of respondents told WISPIRG that having transportation options other than driving is “very important” to them when they think about where they’ll live after graduation. 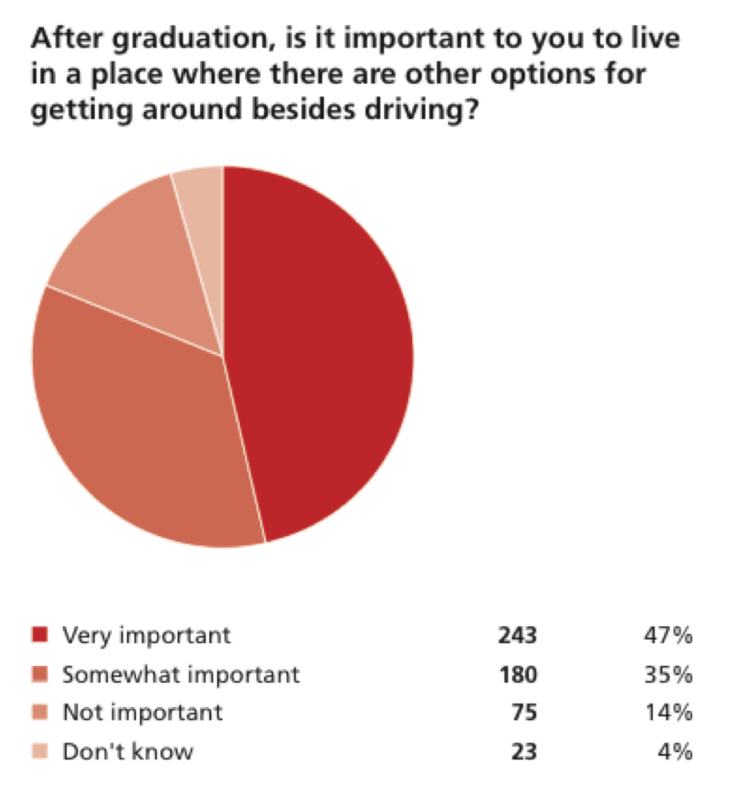 An additional 35 percent said it was “somewhat important.” Sixty percent said they’d be at least “somewhat more likely” to stay in Wisconsin after graduation if they could get around without driving. The survey results echo those from a Rockefeller Foundation/Transportation for America study, released last month, which found that four in five respondents wanted to live in a city where they could get around without a car and two-thirds said access to high-quality transportation was one of their top three criteria for choosing a place to live. Speight says state policymakers have ignored the needs and desires of the very people that Wisconsin should be trying to court. Like the rest of the country, Wisconsinites are driving less than they used to. Total vehicles-miles-traveled peaked in 2004 after decades of steady growth. Meanwhile, transit and bicycling are on the rise. Madison’s transit ridership has risen in 12 of the last 13 years, Speight reports. In La Crosse, it’s almost doubled since 1997. And bike commuting has grown by 227 percent since 2000. From WISPIRG’s survey of 530 college students. Meanwhile, the state keeps dropping lots of money on highway expansion. “Over the past fifteen years, total spending on major highway development in Wisconsin has increased by 90 percent,” Speight wrote. Especially wasteful, he says, are four new major highway projects the state recently approved, totaling at least $1.2 billion. Meanwhile, state transit funding has yet to recover from a 10 percent cut inflicted by legislators a few years ago. Getting transportation policies in line with the preferences of the people could be a first step toward reversing “brain drain” in Wisconsin. The state’s famous university system attracts tens of thousands of ambitious young people, but many leave the state after graduation. That’s a trend that needs to be reversed, argues the Wisconsin Policy Research Institute, which estimates the state needs to nearly triple its annual retention of young professionals to be competitive. WISPIRG thinks the state needs to learn more about young people’s transportation preferences, reconsider highway expansion projects, and boost funding for transit and active modes. While conventional wisdom used to hold that cities needed to attract businesses to attract people, that idea has been turned on its head in recent years. Young people increasingly choose where they want to live first and then look for jobs there. The new mantra is that cities first need to become a place where talented people want to live and employers will follow. So Wisconsin’s cities need to start building the kind of infrastructure those talented people are looking for — and it’s not mega-highways. I am a software engineer who grew up in Wisconsin. I don’t live there right now, more because there are few good tech jobs than because transit service isn’t great, but I sure don’t appreciate the latter. Wisconsin actually has excellent public services and a lot of lovely, walkable prewar housing stock at very affordable prices, and I could certainly see returning someday, although unfortunately the Republican administration is on a jihad against Wisconsin’s cities and public services. Milwaukee’s urban form in many ways resembles that of the vaunted Portland, except even more of it is pre-war walkable streetcar suburban neighborhoods, and it also was one of the first cities to tear down a highway. Bike infrastructure is OK, and the continuous street grid with quiet side streets paralleling major arteries makes bicycling perfectly safe even without much infrastructure. Highways are what connects cities/towns, to other places, however that is lost on bicycle advocate groups. Since the bike fed has linked to this article, I just want to ask, when are you going to start accepting reality, instead of censoring other peoples views? Bicycle advocacy groups are pushing agenda 21, the treehugger.com website confirms it. I wouldn’t call it a “non-scientific survey”, I’d call it a “non-random survey”.